Jadeja's unbeaten 86 got India to 292, after which England batted well to stretch their lead over India. Flashback to 2014. India’s only silver lining in a forgettable summer in England came at Lord’s. 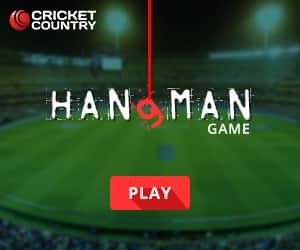 Ishant Sharma took seven wickets and Ajinkya Rahane had scored century. But the effort that turned the game on its head came from Ravindra Jadeja. Down the order, he had scored a 57-ball 68 which was pivotal in India winning the only match of the series. Cut to present and Jadeja, no longer a regular in India’s Test squad, bailed India out of trouble at the Oval. With the bat, he scored a counter-attacking 86 and forged crucial stands with debutant Hanuma Vihari and India’s No. 11 Jasprit Bumrah to take India to 292 and thwart England’s hopes of escaping with a huge first-innings lead. Later, with the ball, Jadeja picked up his fifth of the match, dismissing a stubborn-looking Moeen Ali for 20. Despite Jadeja’s efforts though, it was England who finished Day 3 of the fifth and final Test well on top. Alastair Cook, playing his final international innings, is four shy of scoring his second half-century of the match as England finished the day on 114/2, gaining a healthy 154-run lead. If today doesn’t make Jadeja the No. 1 bowling allrounder in the Indian team over R Ashwin, nothing will. 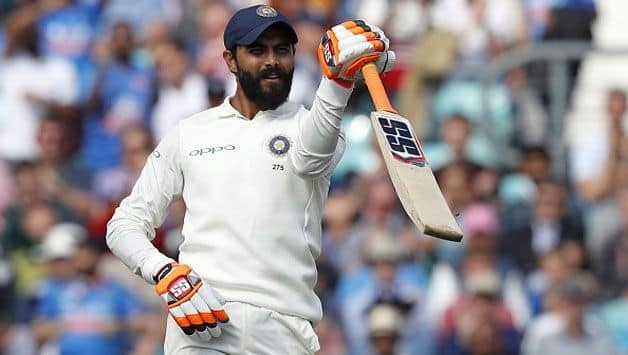 Playing just his second Test in nine months, Jadeja put a price on his wicket and showed how India could have really benefitted from having him at No. 7. For the first time in the series, India’s lower order batted with resistance and showed character. Vihari, on his Test debut, struck a fine half-century, and Jadeja took it forward from there. 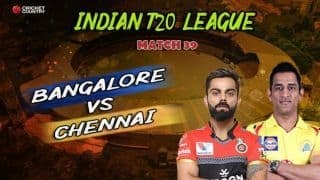 The two overnight Indian batsmen put on 77 for the seventh wicket after which Jadeja combined to add another 43 with the last two wickets to reduce India’s deficit to 40. Out walked Cook to a rousing reception and he batted resolutely. It took him almost an hour before he scored his first runs of the second session, and despite the numerable play and misses, the bunts and the dabs, the jumps and hops, Cook stayed out there, and needs 30 more to surpass Kumar Sangakkara as the fifth-highest run-getter in Tests. Giving him company at the other end was Joe Root, who looked confident for his 29 and would be eager to end the series with a valuable score. India were quick to ensure England did not repeat their first innings opening wicket partnership. 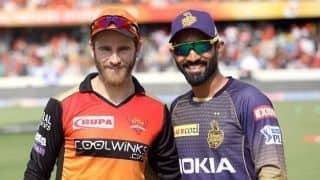 Keaton Jennings shouldered arms to Mohammed Shami and was bowled, bringing his abysmal campaign in the series to an end. It was a far cry from the Jennings we saw score a century on debut against India in 2016. Cook and Moeen did what they do best, absorb. India were once again terrible with their reviews, wasting both inside 12 overs. To add to their woes, their safest fielder, KL Rahul, dropped a regulation catch of Moeen at second slip. But it wouldn’t hurt India much. 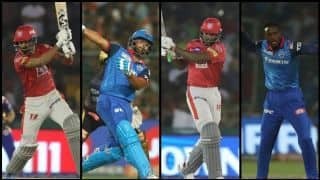 Jadeja landed one into the rough, the delivery after the ball was changed, and Moeen, in an attempt to drive against the turn, missed putting bat to ball. India began the day with a tough task. Jadeja had to endure a scratchy first half an hour before flicking Stuart Broad for his first boundary, which gave India a push. Vihari, having battled hard, crunched a couple of boundaries to take India past the 200-run mark, a total that had looked improbable considering India’s lower-order struggles in the series. The nervy moments had evaporated and with each passing over, both batsmen grew in confidence. Vihari scampered for a single to bring up his maiden half-century for India. 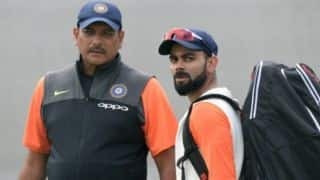 For someone who was added to the Indian squad and had his selection questioned, Vihari cut a figure complete opposite to the one that batted on Saturday. Yesterday’s countless misses, top edges and leg before appeals had converted into crisp drives, confident punches and swift running between the wickets. Broad and James Anderson delivered a probing morning session spell, but Vihari and Jadeja endured. 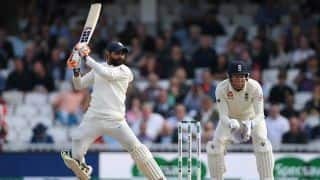 The sight of Broad bowling to Jadeja was reminiscent of Mohammed Shami bowling to Moeen Ali in the first innings with countless play and misses. India lost Vihari moments before lunch, and Ishant Sharma soon after team. 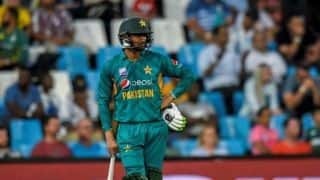 Shami tried to hang around but had another brain-fade moment with the bat. 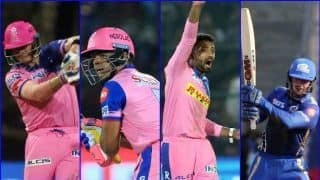 Last wicket remaining, there was a feeling that Jadeja would go for the jugular and morph into the one-day, T20 mode, no one expected him to be so effective. With a cut off Adil Rashid, Jadeja went past fifty, and a similar sight unfolded. 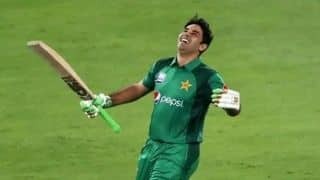 Out came the swirling sword, which he pointed towards the Indian dressing room, almost letting them know how it was a mistake to leave him out of the Playing XI. He disdainfully crunched Anderson down the ground for a six and with the field spread out, continued slogging. Besides his flamboyance, Jadeja was patient enough to ensure he always had the strike. When he didn’t, Jadeja gave Jasprit Bumrah the confidence to produce the dead bat. 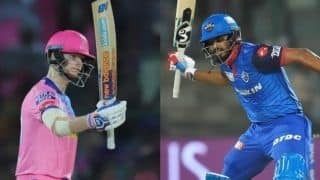 Jadeja was 14 away from his maiden century, and India eight away from 300, when Bumrah was run out. Brief score: England 322 and 114/2 (Alastair Cook 46*, Joe Root 29*; Mohammed Shami 1/36), lead India 292 all out (Ravindra Jadeja 86*, Hanuma Vihari 56, James Anderson 2/54) by 154 runs at stumps on Day 3. Sixth year into Sports Journalism, Aditya Bhattacharya is a Sr. Correspondent with Cricket Country. After a short tenure with Cricketnext/CNN-News 18 Sports, he worked with Cricbuzz and Times of India's online portal. 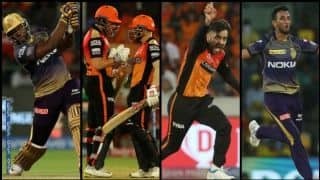 IPL 2019: Can Sunrisers Hyderabad end their losing streak?